Want to keep right up to date with whats happening in Mayflower Nursery? Just add us on Twitter! This term Foundation have been learning ‘All About Me’. Through learning about how to be clean, healthy and safe, Nursery children have been practicing how to keep themselves clean and warm during key worker group time. This week Nursery made fruit faces which was a fun way to learn about eating healthy. The have been learning a song for this, too ‘Here’s my tummy’. 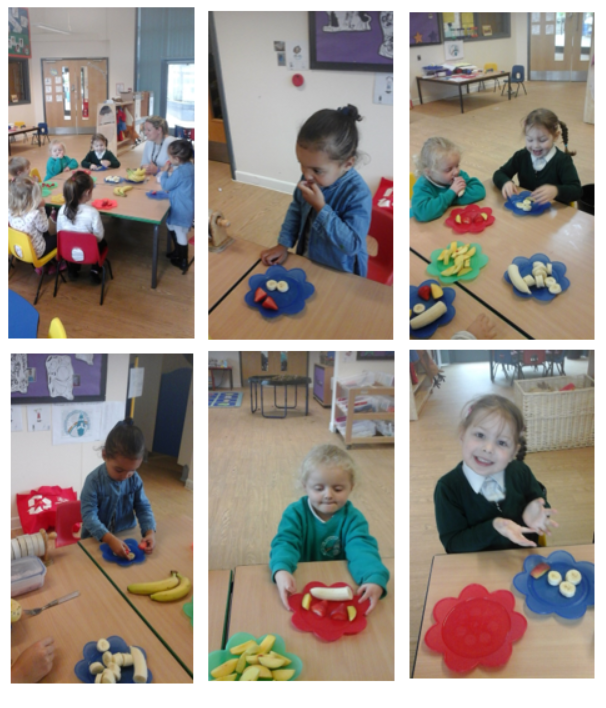 The children really enjoyed trying lots of different fruits, strawberries, peaches and bananas- for some children this was a brand new experience. The children enjoyed seeing, smelling, tasting and touching the fruits and came up with some wonderful and wild faces. The children also demonstrated some fantastic fine motor control as some of the fruit was a little slippery!